Other than Thanksgiving, we had a pretty low key (four day!) weekend. We all have colds around here so we laid low and relaxed. Well everyone else laid low....I've been on a rampage. On Friday, I noticed my Apple watch was missing and after looking everywhere, talking with Apple, retracing my steps, etc. I am at a loss to where it is?! My guess is that one of my kids got a hold of it so I am hoping it is around here somewhere and that it will show up. I feel like I've looked everywhere, but in the mean time, I will keep looking. We had some nice cool weather for a few weeks and then jumped back up to the 90's (noooooo! ), so while the weather was cool, we enjoyed being outside. Madden had a doctor appointment this month and thought wearing a gown was hilarious. He is in the 98th percentile for weight and 95th for height. He is a big boy! Our schedules are changing and re-arranging as some of our activities come to an end or switch around. We were sad to say goodbye to Gabriella's speech therapist recently. She has been Gabriella's speech therapist since she started speech earlier this year, and we just loved her! Gabriella has a new speech therapist who is just as sweet, and Gabriella really likes her too so we are so thankful. Plus, little miss will also be starting more speech therapy through the school district. We had the best Thanksgiving with our family. There were 14 of us this year-lots of food, lots of laughs, and lots of thankfulness. Us on Turkey Day :) Four years ago around this time, I was going through fertility treatments. I was hesitant to do our IVF cycle with the holidays coming up that year because I didn't want to be disappointed and depressed through the holidays if it didn't work, but I trusted God, his timing, and set my fear aside....and two days before Thanksgiving (2013), we found out that I was pregnant! And we announced to our families on Christmas Eve that year. Then at Thanksgiving 2015 we announced that we were pregnant again! So thankful for these two and this time of year as I reflect on God's faithfulness to us. And just as soon as everyone left Thanksgiving day, we started putting up our Christmas decorations. Gabriella was so excited to help with the tree and she took decorating it very seriously. And now that it's up we spend a lot of our time telling this one NO TOUCH! 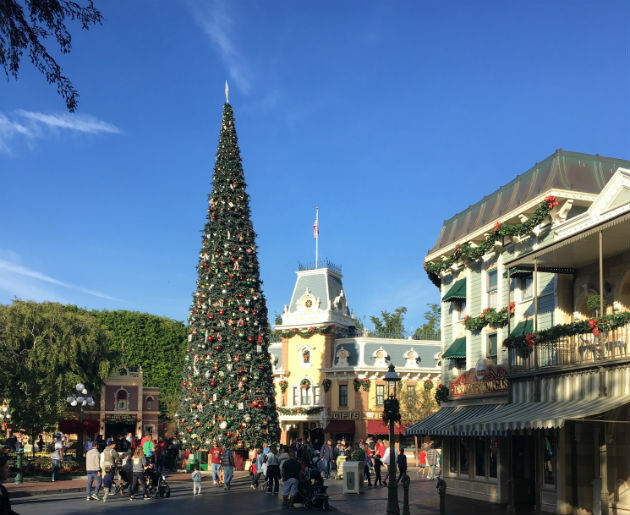 We are loving that it is starting to look like Christmas everywhere...especially Disneyland! We recently went to see all the Christmas stuff, and had one of the best days (despite the crowds). Madden is now tall enough to ride more of the rides and was thrilled to ride Mater (he is obsessed with Cars!). We saw a new show- Mickey and the Magical Map- which I definitely recommend. And between the show and the Santa parade, we got to see a lot of characters which both kids loved! Well that is a wrap on what life has looked like lately. Have a happy Monday!